One Piece 819 Spoilers: The last Chapter end with Kouzuki clan are stone masons for a very long time. They made Poneglyphs..…!!! So what happens next..? 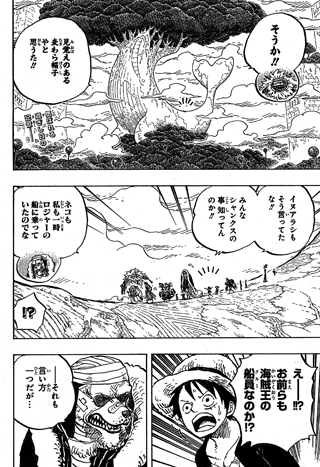 find out story on One Piece 819 Spoiler Discussion 「ワンピース ネタバレ」 第819話 at Mangaspoiler.com. if you would like to discuss the Spoiler or prediction, please leave a comment below. Oden was the crewnate of Roger. Robin remembers Rayleigh’s words “We know everything about the history”. Doflamingo and Caesar as well as Kaidou were trying to capture Momonosuke and other samurais to know the secret of the world. But the samurais (Momonosuke, Kinemon etc…) know nothing about it. Raizou says they will defeat Shougun and open Wano country. Shougun is allied with Kaidou. They are now controlling most regions of Wano. Inuarashi says Mink tribe will show their “true power” when they confront Kaidou army again. Finally Luffy decides to form an alliance with them. He declares he will defeat Kaidou. According to Luffy, an alliance means “friends”, but Law instantly denies it (funny scene). Luffy tells them to wait until he brings back Sanji. He says Sanji is strong. Luffy will go to the whereabouts of Big Mom with Pekoms and doesn’t intend to fight her. Meanwhile near the foot of Zou, Jack comes back…. One Piece 819 Trivia: Robin was the second to last member to be sent away by Kuma and the second to last member to return to Sabaody Archipelago. This is rare. The.moment when spoiler is out n no one’s cares, lol poor antarus, the spoiler guy this week.. Someone will post the same spoiler picture and takes all the credit on the next page..
the guy from mangamint or something taht posts the spoiler after everyone else will now get the credit!!! Spoiler is out, check the previous page. that proofs what kind of beast pirates they were man !!!! In other news, after the one piece reveal, now we find more about roger’s unknown nakamas or allies. Wait. U meant revealed by Whitebeard? Actually, they weren’t Roger’s crew. They were Oden’s subordinates. I wanna see Scopper Gabban, don’t really care about roger’s other crews tbh..